In my old neighborhood I was able to grow a very tall, multi flower plant. The stalk a half to a full inch thick. Been trying to get a repeat performance every since. OP, I love sunflowers but I would not grow them in my front lawn. But I would them in my flowering beds - front, back or side. To each his own. I actually like Sunflowers and have nothing against them, or other things people like to grow. I have hundreds of Shasta Daisies in my back yard and I had someone tell me she considers them weeds and I was very offended by that so I would never be judgmental about what one person thinks is pretty and others consider weeds. I was just curious what people think of Sunflowers in general. One of my neighbors just lets them grow randomly in weird places around her front yard and in the middle of the front lawn. Maybe she just likes them and that is fine! We used to live in one of those perfectly manicured type neighborhoods and I would much rather see yards with wildflowers and random stuff growing--as long as it is cared for and not making the neighborhood look run down. My next door neighbor has a lot of random Sunflowers growing all over their back yard. If they make there way over to my backyard I will let them grow. I guess it depends where in the front--don't think I would let it stay in the middle of the front lawn but maybe try to move it close to the house or in a bed. Just about everything loves them, butterflies, birds, and yes even the squirrels in the fall. Definitely the squirrels go after sunflower seeds. Might not fit all occasions. A watermelon growing in a corn field would probably be considered a weed around here. I for one can find a use for a nice ripe watermelon but it would be a weed in my corn field, if I had a corn field. Beautiful! That must be some kind of a hybrid? It looks a lot like what we used to call Indian blanket flowers. I think they call them something else now. My black-eyed susans are in full bloom right now. I think they must be a cousin. Rudbeckia. They grow like weeds. They are especially dear to me because I went home and Dad helped me dig some out from the yard where I grew up. I leave the dried stems up all winter. It looks a little ragged but the birds appreciate it. When my husband's cousins from Holland were here they said that in the Netherlands they call them Susannah-with-the-beautiful-eyes. I think I like that better. I remember the first time I saw fields of sunflowers as we were traveling. And as the day went on all those sunshiny blossoms followed the sun just like an entranced audience following an actor on the stage. So in the morning they all looked east in anticipation and at the end of the day were all watching the sun fade in the western sky. It was whimsical. Yes, they are some sort of multicolor variety. 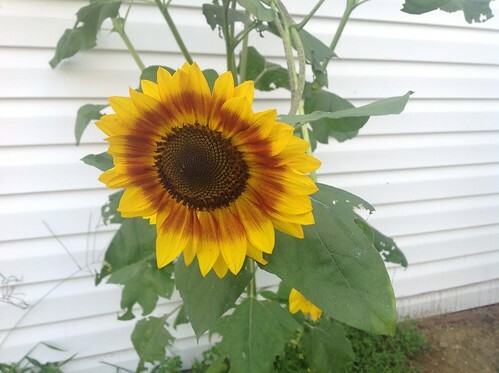 Some are like the one pictured, some are all yellow petals with brown centers on smaller heads. I have a bed out by the road that I've given over to the weeds, then. There are joe pye weed, eupatorium perfoliatum and self-sown sunflowers blooming there now. I planted the sunflowers one year, and I guess the seeds fell on the ground, because now they come back by themselves. If my neighbors don't like them then too bad... I got the idea to plant them out by the road because there is a house across the way that has a TON of sunflowers out front every year. We live in a rural area, so I think it looks pretty. They definitely can look wild, but if there are a lot of them it looks cool. Plus how awesome is it that these are native to North America? There are so many different sizes and colors to choose from. Sunflowers feed pollinators and they feed hungry animals. You can also eat the seeds of many varieties. If they self sow that is just a bonus. Not a weed. Last edited by kinkytoes; 08-17-2014 at 08:07 PM..